The goal of glaucoma treatment is to lower intraocular pressure in order to slow retinal ganglion cell loss. Currently, this can be achieved with medications, which typically constitute the first line of treatment, laser treatment, or surgery. With appropriate patient selection, IOP is reduced by 25-30% 1 year after ALT. However, the effect fades over time, with an attrition rate of about 10% per year. Traditionally, patients believed to be ideal candidates for the procedure are older and phakic with sufficient TM pigmentation. However, newer reports have confirmed only pretreatment intraocular pressure as a significant predictor of successful response. In patients younger than 50 years, ALT is not recommended unless significant TM pigmentation is present due to exfoliation or pigment dispersion syndrome. The Glaucoma Laser Trial performed over 2 decades ago has demonstrated equivalency between ALT and medical treatment as initial treatment modalities in patients with glaucoma. In the Glaucoma Laser Trial study, 11% of the ALT-treated eyes required repeat ALT or glaucoma filtration surgery at the end of follow-up. In comparison, 34% of the eyes in the medical arm required ALT or glaucoma filtration surgery at the respective time-point. However, the results of the study may not be directly applicable to current glaucoma practice as the newer prostaglandin analogues became available after study initiation. Topical anesthesia is required (0.5% of proparacaine hydrochloride) to perform ALT without any significant discomfort on behalf of the patient. A Goldmann 3-mirror lens (see image below) is used to visualize the angle structures and direct the laser energy toward the TM. A coupling agent such as 2 or 2.5% hydroxypropyl methylcellulose (Gonak, Goniosoft, or Goniosol) is necessary since the radius of curvature of the Goldmann 3-mirror lens is smaller than that of the cornea. Alternatively, a Ritch lens can be used, which allows angle structure visualization without much rotation. The Ritch goniolens provides a 1.4-times magnified view of the angle structures, which, theoretically, should reduce the spot size accordingly. 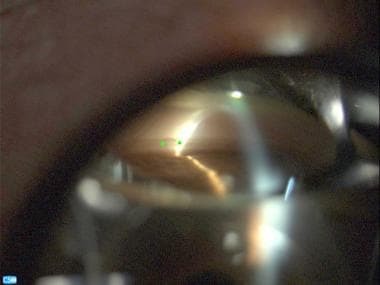 A continuous-wave argon green laser with a wavelength of λ=455-529 nm attached to a slit lamp and equipped with an aiming beam is used to generate the energy necessary to perform the procedure. ALT is performed with the patient in a sitting position in front of a slit lamp equipped with an argon laser. Patients are usually pretreated 30-60 minutes before the procedure with (1) a drop of pilocarpine (1-2%) to put the iris on stretch, creating more space and therefore preventing inadvertent peripheral anterior synechiae formation and (2) a drop of apraclonidine 0.5% to decrease the incidence and the severity of a possible postoperative transient IOP elevation. The appropriate laser settings are a spot size of 50 μm, a duration of 0.1 sec, and a power of 500-1200 mW, depending on the level of TM pigmentation. In general, the more pigmented the TM, the less energy necessary. 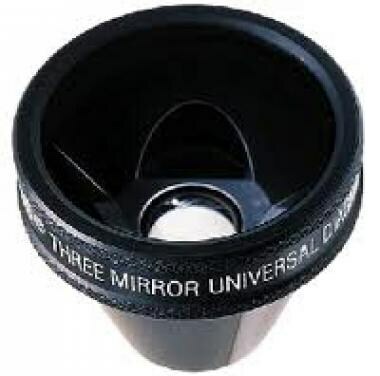 The Goldmann 3-mirror lens is placed on the cornea and adequate visualization of the angle structures is ensured. The authors of this article usually start with treatment of the inferior angle, because it is wider, which makes the procedure technically easier. The laser beam is aimed at the junction of pigmented/nonpigmented TM, and the laser energy is adjusted until a mild blanching effect is observed. Vapor bubble formation is a sign of excessive energy and should be avoided. To ensure maximal delivery of the energy, the aiming beam should be kept in the center of the mirror. Fifty laser spots are delivered equally spaced to the inferior 180° of the angle (see the image below). Treating all 360° is not more effective and is associated with a higher incidence of postoperative IOP spikes. The superior angle can be treated in a separate session in the future, if necessary. The procedure is completed without any significant pain for the patient. Gonioscopic view of the angle indicating the correct placement of argon laser spots. The anticipated response can be delayed up to 6 weeks after the procedure. Patients are instructed to use a topical corticosteroid eyedrop such as prednisolone acetate 1% 4 times daily for 4-7 days after the procedure, along with all their previous glaucoma medications. Patients are typically seen in follow-up 1 week after the procedure. The chance of success with re-treatment using ALT is considerably smaller compared with the initial procedure. A mild iritis is not unusual after ALT and peaks the second day after the procedure, causing occasionally photophobia. Treating the patient with a short course of topical corticosteroids (1% prednisolone acetate 4 times a day) for 4-7 days after the procedure is recommended. Peripheral anterior synechiae (PAS) that can compromise outflow may form if the laser energy is directed too posterior toward the iris and are more common in narrow angles. In most cases, PAS are small and not clinically significant. Disruption of endothelial cells with polymorphism and an increase in cell size,  indicative of a mild reduction in numbers, has also been reported. Transient epithelial burns can be also observed and are more likely with high power settings. Finally, an increase in the incidence of bleb encapsulation after trabeculectomy,  which may represent the next step in the treatment of medically uncontrolled glaucoma, has also been reported. Wise JB, Witter SL. Argon laser therapy for open-angle glaucoma. A pilot study. Arch Ophthalmol. 1979 Feb. 97(2):319-22. [Medline]. Ticho U, Zauberman H. Argon laser application to the angle structures in the glaucomas. Arch Ophthalmol. Jan 1976. 94(1):61-4. [Medline]. Samples JR, Singh K, Lin SC, Francis BA, Hodapp E, Jampel HD, et al. Laser trabeculoplasty for open-angle glaucoma: a report by the american academy of ophthalmology. Ophthalmology. 2011 Nov. 118(11):2296-302. [Medline]. Latina MA, Sibayan SA, Shin DH, Noecker RJ, Marcellino G. Q-switched 532-nm Nd:YAG laser trabeculoplasty (selective laser trabeculoplasty): a multicenter, pilot, clinical study. Ophthalmology. 1998 Nov. 105(11):2082-8; discussion 2089-90. [Medline]. Juzych MS, Chopra V, Banitt MR, Hughes BA, Kim C, Goulas MT, et al. Comparison of long-term outcomes of selective laser trabeculoplasty versus argon laser trabeculoplasty in open-angle glaucoma. Ophthalmology. 2004 Oct. 111(10):1853-9. [Medline]. Kent SS, Hutnik CM, Birt CM, Damji KF, Harasymowycz P, Si F, et al. A Randomized Clinical Trial of Selective Laser Trabeculoplasty Versus Argon Laser Trabeculoplasty in Patients With Pseudoexfoliation. J Glaucoma. 2013 Jul 17. Epub ahead of print. [Medline]. Holló G. Argon and low energy, pulsed Nd:YAG laser trabeculoplasty. A prospective, comparative clinical and morphological study. Acta Ophthalmol Scand. 1996 Apr. 74(2):126-31. [Medline]. Damji KF, Bovell AM, Hodge WG, Rock W, Shah K, Buhrmann R, et al. Selective laser trabeculoplasty versus argon laser trabeculoplasty: results from a 1-year randomised clinical trial. Br J Ophthalmol. 2006 Dec. 90 (12):1490-4. [Medline]. Kramer TR, Noecker RJ. Comparison of the morphologic changes after selective laser trabeculoplasty and argon laser trabeculoplasty in human eye bank eyes. Ophthalmology. 2001 Apr. 108 (4):773-9. [Medline]. Ekici F, Waisbourd M, Katz LJ. Current and Future of Laser Therapy in the Management of Glaucoma. Open Ophthalmol J. 2016. 10:56-67. [Medline]. Tzimis V, Tze L, Ganesh J, Muhsen S, Kiss A, Kranemann C, et al. Laser trabeculoplasty: an investigation into factors that might influence outcomes. Can J Ophthalmol. 2011 Aug. 46 (4):305-9. [Medline]. Spaeth GL, Baez KA. Argon laser trabeculoplasty controls one third of cases of progressive, uncontrolled, open angle glaucoma for 5 years. Arch Ophthalmol. 1992 Apr. 110 (4):491-4. [Medline]. Bovell AM, Damji KF, Hodge WG, Rock WJ, Buhrmann RR, Pan YI. Long term effects on the lowering of intraocular pressure: selective laser or argon laser trabeculoplasty?. Can J Ophthalmol. 2011 Oct. 46 (5):408-13. [Medline]. The Glaucoma Laser Trial (GLT) and glaucoma laser trial follow-up study: 7. Results. Glaucoma Laser Trial Research Group. Am J Ophthalmol. 1995 Dec. 120 (6):718-31. [Medline]. Katz LJ, Steinmann WC, Kabir A, Molineaux J, Wizov SS, Marcellino G, et al. Selective laser trabeculoplasty versus medical therapy as initial treatment of glaucoma: a prospective, randomized trial. J Glaucoma. 2012 Sep. 21 (7):460-8. [Medline]. Lee R, Hutnik CM. Projected cost comparison of selective laser trabeculoplasty versus glaucoma medication in the Ontario Health Insurance Plan. Can J Ophthalmol. 2006 Aug. 41 (4):449-56. [Medline]. Seider MI, Keenan JD, Han Y. Cost of selective laser trabeculoplasty vs topical medications for glaucoma. Arch Ophthalmol. 2012 Apr. 130 (4):529-30. [Medline]. AGIS Investigators. The Advanced Glaucoma Intervention Study (AGIS): 11. Risk factors for failure of trabeculectomy and argon laser trabeculoplasty. Am J Ophthalmol. 2002 Oct. 134 (4):481-98. [Medline]. The Glaucoma Laser Trial. I. Acute effects of argon laser trabeculoplasty on intraocular pressure. Glaucoma Laser Trial Research Group. Arch Ophthalmol. 1989 Aug. 107 (8):1135-42. [Medline]. Hong C, Kitazawa Y, Tanishima T. Influence of argon laser treatment of glaucoma on corneal endothelium. Jpn J Ophthalmol. 1983. 27 (4):567-74. [Medline]. John Danias, MD, PhD, William Tsiaras, MD, Cynthia Grosskreutz, MD, PhD, Louis Pasquale, MD, Douglas Rhee, MD, Teresa Chen, MD, David Walton, MD, Mark Latina, MD, Janey Wiggs, MD, PhD and Joseph Ducharme, MD for sharing their valuable clinical experience with me.